This is Rosie. She's a commissioned painting I just finished. She weighs a big two pounds! It was a pleasure painting her, I must say. She was painted on a small 6x8x1.5 gallery-wrapped canvas. Rosie is Sold. I'm moving into the busiest time of year for me this week and probably won't be able to publish a painting a day, but I will publish whatever I'm able to finish over the next few mad days. Hope everyone is staying warm and dry. There's a kind of funny story associated with this painting -- and a sad indication of how non-assertive I am. A "potential" customer at Portland Saturday Market, where I show my clocks and paintings on weekends in Portland, OR saw a painting I had done of a golden retriever with a stick in his mouth and told me he needed a Newfoundland dog clock, would I mind just changing that dog to black for him -- just like that, no problem. Well, obviously, there was a problem; one can't just change color and come up with a different dog breed. So, of course, I painted a Newfoundland in a similar pose to the golden painting -- just like that! 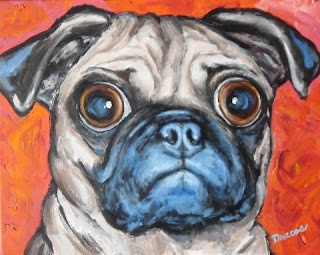 The compensation is that I now have a new beautiful dog painting, which image I'll add to my ever-growing number of clock face images, and, of course, a beautiful original that someone someday will buy, I think. So here it is; it's 8x10 acrylic on heavy cardstock, selling for $100.00, and I think it's quite nice, even if I didn't just whip it out in 20 to 30 minutes as this fellow thought I could do. I wish I could paint that quickly; maybe I could actually get not rich but well off doing what I love more than anything else!